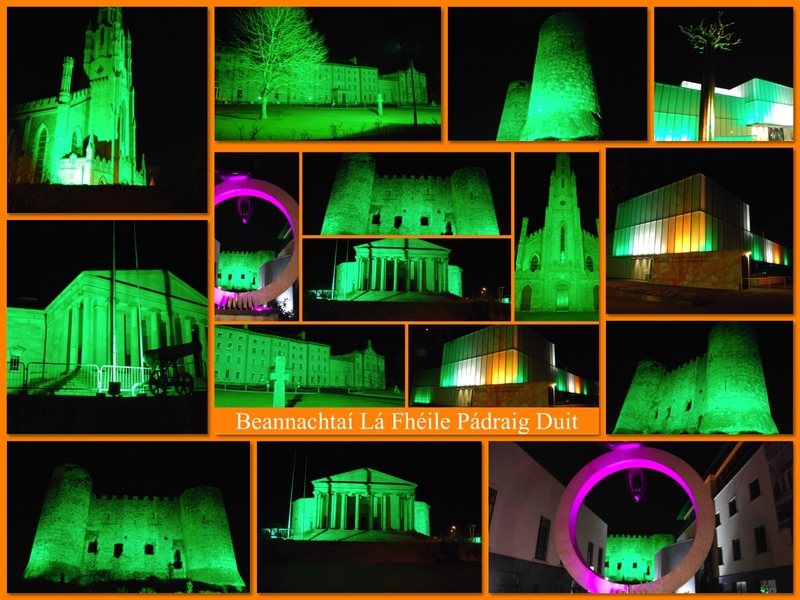 Beannachtaí Lá Fhéile Pádraig Duit! … Happy St Patricks Day to you! This is the full text I received from Louise Nugent about a Carlow Priest who went on pilgrimage to Jerusalem. It’s a fantastic tale and I look forward to finding out a little more! One of the strangest Irish pilgrims who, in the past, walked to Rome and the Holy Land, was Father Joseph Braughall, once parish priest of Graig-na-managh in the County of Carlow. Sometime in the year 1821, Father Braughall, a man of forty, was stricken with a severe illness. As he lay suffering he vowed he would make a pilgrimage to the Holy Land on foot as soon as he recovered. There was no question of “if” about him: he would recover and complete his pilgrimage. And lest someone more worldly-wise than he should try to dissuade him, he discussed his vow with no one. Allowed a leave of absence by his Bishop, Dr. Doyle, for his complete convalescence, Father Braughall left Carlow in the summer of 1822, heading for Paris, the first stage of his journey. In an old parish chronicle it is recorded that his whole capital was £5, a sum he had acquired by the sale of his furniture a few days before he set out on his travels. Europe was in its customary turmoil, spy fever was rampant then as it is now, and pilgrims, in the manner of the Middle Ages, were not encouraged by the authorities. If Father Braughall was aware of European chaos, he was not daunted by it. He arrived in Paris where ill health again afflicted him. For the moment his steadfast confidence seems to have deserted him. He wrote to his Bishop reporting his progress and his plans. He was afraid ill health would defeat his pilgrimage, but as a substitute, he proposed to join the Carthusians, and announced his intention of proceeding to Italy, to a house of that Order. Apparently on his journey to Rome his health improved for he is next heard of at the Vatican. He was received in audience by His Holiness, Pope Pius VII, who blessed his pilgrim’s habit and presented him with the necessary documents, sealed with the seal of the Holy See, for visiting the Holy Places of Jerusalem, Syria, Judea and Palestine. In great kindness the Holy Father spoke of the dangers that faced the pilgrim and offered to free him from his vow. It would seem that Father Braughall had put aside for the moment his plan to join the Carthusians. He expressed his gratitude for the Holy Father’s kindness but humbly refused the dispensation. The Holy Father than gave his blessing to Father Braughall and arranged that he would receive a special licence permitting him to leave the Irish Mission for the purpose of making the pilgrimage to the Holy Land. Emaciated and weary, he would have gone at once, without rest, to Mount Calvary. He found that the great church built on the site was locked and that no one was allowed to enter it except at certain times and then only on payment of a fee to the Turkish Governor of the city. He requested an audience with the Bashaw of Jerusalem, who was also Governor of the Province. The story of his journey and, it may be supposed, his persistence, impressed the Turk so favourably that he presented Father Braughall with a free and official pass to all the shrines and churches of Jerusalem. When the brief daily opening of the door came next day Father Braughall was there with the other pilgrims. Because of their Muslim death customs, but more to irk the Christian, the Turkish authorities had threatened to impose a crippling fine if any pilgrim should die in the church. To avoid this fine, the Christian superiors of the Holy Land decreed that the first visit to the church should not exceed twenty-four hours. Father Braughall was irked by this regulation but recognised its wisdom. The only diet allowed in the church was bread and water; only the strongest could endure it for more than the prescribed period. On his second visit Father Braughall remained in the church for nine days and nights, celebrating the Holy Sacrifice of the Mass at all nine Stations preserved in the building. He seems to have made many friends, for when he left Jerusalem he was carrying many letters from communities and priests to the Holy Father. Getting home, he found, was just as difficult as getting to Jerusalem. He turned up in Cairo where he found hospitality in a convent, probably Franciscan, where there were six religious, four priests and two lay brothers. He was suffering from fever and dysentry. His hosts were the only missionaries in the country, and, as he reports simply, they were all in perfect health on his arrival. Within a few days all six were dead from the fever. He buried them with his own hands and took over their duties until he was relieved. Whether or not he was a plague carrier when he arrived in Cairo, he omits to say, but he does report that upwards of forty thousand persons died of plague in that city, including the wife of the English Consul, whom he had visited. It was with the stricken Consul’s help that he secured a passage from Alexandria back to Leghorn. Presumably he reached Rome again and discharged the errands he had contracted to do in the Holy Land. Ill health again became his portion. His next few years were spent in a fantastic cat-and-mouse game, between near-health and serious illness. In those years he had drifted-and drifted seems to be the word, since nowhere in his reports of this period is there any sign of plan-desolately from monastery to hospital in Portugal and Spain in search of health. Penniless as ever, he was dependent on the charity of those he met, and everywhere he went that charity was forthcoming in abundance. A gaunt bent figure, with flowing iron-grey hair and the sharp features of the half-starved, Father Braughall arrived back in Carlow in 1838, sixteen years of wayfaring behind him. He remained in Carlow, a guest of the college, for a few months. The President of the College, Dr. Fitzgerald, invited him to stay permanently. But just as he had refused the dispensation of the Holy Father, so now he refused the hospitable offer of Dr. Fitzgerald. In 1839 he set out again for Italy, determined to end his days as a hermit. That he had made the pilgrimage to the Holy Land with the permission of his Bishop and His Holiness, the Pope. Don Guiseppe Braughall, Prete Irlandese, Residente in Napoli, Naples. He ate the cake while he rested that night and in the morning he woke up perfectly well, all illness and weariness gone from him. His health continued good for three days, the only time he had been completely free from sickness and pain since he left Paris. Father Braughall received his certificate at last and again approached the local authorities for permission to enter a hermitage. The Bishop of Naples was cautious. He pointed out that there were so many imposters and renegades on the roads that it was necessary to obtain Rome’s confirmation of the certificate. Poverty, acute ill health and suspicion were the lot of Father Braughall while he waited for the Vatican’s confirmation of his certificate and approval for his plans. When a favourable reply was at last received from Rome Father Braughall was too weak to celebrate the Holy Mass. He turned to Saint Benedict for help. Broken in health he left Naples behind him and climbed the road to Mount Cassino, the famous Benedictine monastery that was to figure in world history again a century later. Here he found what he long sought – the peace of God. He made yet another pilgrimage to the Holy Land from Mount Cassino. One morning, while making his thanksgiving after Mass, a hand tapped him on the shoulder. A strange youth stood beside him. Father Braughall stooped to pick up his breviary, When he straightened up a moment later he found the youth had gone. Hurrying to the harbour he found the ship ready to cast off. The ship’s captain welcomed him and offered him a free passage. With the conviction that his visitor had been his Angel Guardian, Father Braughall accepted the captain’s offer. The extraordinary piety of the Irish wayfarer of God edified everyone in the monastery where his memory is still revered among the surviving community as that of a saint. It is recorded that when the King of Naples and his family visited Mount Cassino they found Father Braughall kneeling in adoration before the Tabernacle. The royal party knelt behind him, and when they were leaving each of the party, preceded by the King, reverently took up and kissed the hem of Father Braughall’s habit, while he, unconscious of their presence in the depth of his devotions, prayed on. He died on the Feast of the Ascension in the year 1850 at the hour of Vespers and, his pilgrimage at last ended, he was laid to rest near the tomb of St. Benedict. My pilgrimage to Rome in 2010 was strongly influenced by the exploits of St Columbanus, who as I have said in previous posts, is considered to be a native of my own county. That fascinated me no end. That leaves Jerusalem out there tempting me to get back on my bike. And just as the Carlow connection prodded me to take to the Via Francigena, I find connections between here and Jerusalem drawing me to the cradle of all religions, or at least providing justification for another adventure! Thanks to Louise Nugent, of Pilgrimage in Medieval Ireland Blog, for a fantastic article about a Carlow Priest, Father Joseph Braughall who made the pilgrimage to Jerusalem in 1821. The Blog informs that Fr Braughall was granted leave of absence by Bishop Doyle – aka ‘JKL’, (James of Kildare & Leighlin diocese). Where do you think I was born and reared? in JKL Avenue…. It’s looking more and more likely that I will be mounting up for Jerusalem this summer! When i get the chance I will post it up in full.